Life is just not fair - or at the very least - dental care is not fair! Overseas we were given ONE cleaning a year - and often it took longer than that for them to work us in. I didn't realize Stacia never got any sealants. Arielle should have had more on the back teeth and didn't get them. The boys had sealants when we went, and were young enough that they are just now due for more. I discovered I don't know how to breathe through my nose. 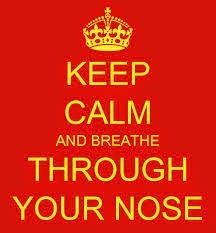 I was doing just fine until she said, "Breathe through your nose," and I thought, "OH NO - I'm doing it wrong. I don't know how to breathe through my nose!" Michael helpfully pointed out my "blonde roots were showing." I survived. 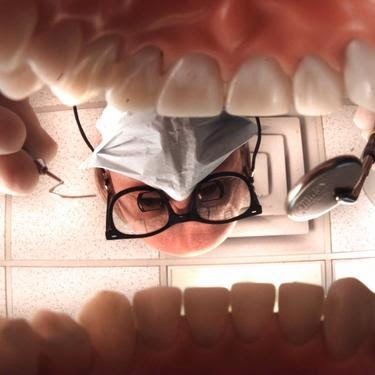 I also discovered - by listening today and asking some direct questions - the theory at our dental clinic seems to have been to "watch" things.....for instance I need to go back for scaling...the numbers they quoted were the same I remember from Misawa - but HERE they act quicker. The skeptic in me sees this two ways - either 1. Civilian dentists act quick before you move - get the money now, or 2. Military dentists didn't have the manpower to give us standard care. Could be a bit of both. In any event - I will go back for a scaling to help with developing periodontal disease. I will also have THREE cavities filled - and I brush religiously. Nolan had only ONE cavity - and ahem - he isn't religious about oral hygiene. Zander hates anything in his mouth. You can imagine the trouble this creates. He got a lecture about brushing and flossing...and he had ZERO cavities. Stacia LOVES to brush and floss. She has four cavities...and will get sealants. Did you catch that? Arielle and I don't do sweets. We take good care of our teeth. The two of us have 9 cavities to share and periodontal disease. It also appears I have yellow teeth and should whiten them. What's a gal to do? I can't smile until I whiten my teeth ($200-500) - but if I don't do the scaling my teeth may fall out anyway - meaning I don't need to whiten them. The boys do not take care of their teeth - and they are looking pretty. I loved the office. I'm praying they are good at fillings and such. Will their shots hurt???? We went to Twelve Bridges. My wife is a periodontal dental hygienist and when we first started dating she gave me a free cleaning that took an hour. She was checking my teeth I guess how you would a horse and it was a deal breaker if they were really bad. Instead she got mad because I had little plaque, don't floss, no cavities and hadn't been to a dentist in five years. Makenzie Love? Hey, Steve, use your own comment! Makenzie does not have a wife! I'm sorry about all the cavities, but it makes me feel better. You may remember the mess in Carys' mouth a couple of years ago (10 teeth with cavities!). So much of it is genetics, I'm sure. Sometimes no matter how well one brushes and flosses, one has 'bad' teeth. Steve - our two boys seem to have teeth like yours. I cannot believe they have none...I was hoping they'd have some so they would understand the importance of better care of their teeth. Yeah - when I know how well we females are taking care of our teeth and see the x-rays I would have to agree that some just don't have good teeth. I had horrible oral hygiene as a child, and not a single cavity. I only floss twice a week now (sometimes once) & at 61 years old have had 2 cavities. I had my teeth cleaned for the first time ever this past week. Sometimes I think a person can try too hard & it affects the enamel. I have never had sealants either. Just a thought. I am 72 years old and just found out this week that I will have to have a tooth pulled. This is the first of my permanent teeth and will have to go to an oral surgeon because "it's a funny little tooth." I had several cavities which were filled as a child and teenager. As an adult, I have had few cavities. I think much has to do with heredity, but I do brush and floss faithfully. If you are concerned about the shots, the dentist should have "laughing gas" which will put the patient at ease. It's beyond a cliche at this point, but good things do come to those who wait. Getting quality dental care can be tough. Ultimately, more than patience, discernment is what's really gonna get us through and help us ferret out the dental service that suits us and will merit our efforts.